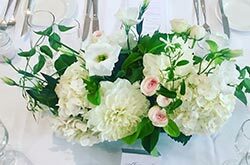 We arrange your special day, from unique floral designs, uplifting centrepieces, creative artwork, mood setting staging, as well as a host of your other requests. Working from a studio in Melbourne, Kelly specialises in exclusive floral designs for your wedding or special event. With a creative flair and strong attention to detail, Kelly will help you choose flowers and decorations that will leave your guests inspired. Offering convenient after hours appointments, contact Kelly to book your free personalised consultation today.